The battle between the GL Corps and Cyborg Superman continues. As it did last issue. And the issue before that. That seems to be a recurring problem with this title, in that as stories continue, there is little advancement of the narrative. Sure, pieces are moved around the board, but no ground is gained to the eventual conclusion. And Mike Perkins continues to pretend to be Neal Adams. There’s one panel in particular that I can’t help but wonder if it’s a direct swipe. I realize Adams has influenced MANY comic book artists, but here it is quite obvious. I hope that Perkins eventually does as Bill Sienkewicz did and cultivates his own style. Hank Henshaw seems to have ditched the five-sided S shield in favor of a black GL symbol. And armed with the Phantom Ring, I suppose calling him Cyborg Superman seems inaccurate. 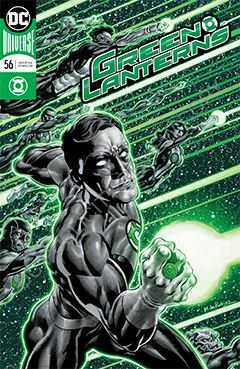 So does that now make him the Cyborg Lantern? I am hopeful next issue will feature the conclusion of the current story arc. There could be a lot for 21 pages to hold, but I’m ready for the story to end. After the recent battles between the GLs and the Dominators, I could do with a simpler story, of Jessica and Simon putting out fires, stopping bank robberies, and eating pancakes.